Buon Natale as I said to people who passed me on the street early this morning. 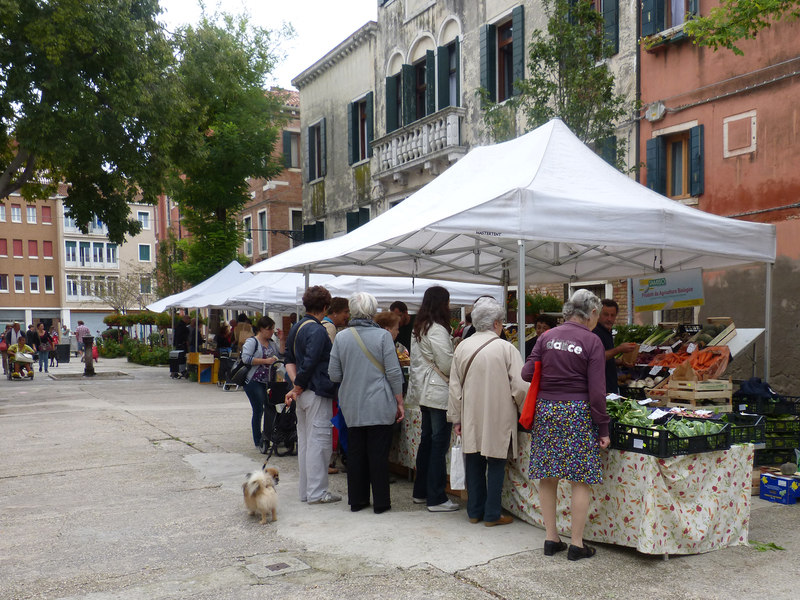 I got a mixed bag of responses that led me to understand that people in Venice don’t do that! The lady whose job is to sweep the streets was out working – she was delighted by my wish and responded with a long string of words I didn’t understand and a big smile. The reactions of men on the street varied from a startled look to a grunt to a buon giorno. For the past week I’ve been searching for Christmas in Venice. This city is filled with churches, sometimes two or three in one block. St. Mark’s Basilica offered a number of times and languages for late night mass last night. Stores have displays ranging from a simple string of lights to extravagant, expensive window displays in the shops of world famous designers. But the old way of celebrating Christmas with one’s family with dinner and mass last night and small gifts and a Christmas lunch today seem to still be the way most Venetians celebrate Christianity’s day of joy. The best thing I found in Venice at Christmas time was a concert in the only gothic church in Venice, Santa Maria Gloriosa dei Frari (shown above). A small orchestra, a choir of 30 or so, and five soloists performed some Bach and Mozart and Bing Crosby (yes, they sang “White Christmas.”) It was lovely. Here are a few photos of Venetian Christmas scenes. The first thing most people see in Venice: Santa Lucia rail station, now dressed for Christmas. Agi and Blaine on the high water walkways outside St. Mark’s Basilica. A little high water made a nice reflection outside the upscale shops near St. Marks. Somehow a Walmart Santa made its way to Venice, where it stands guard over an ancient well. A window display of Venetian Christmas glassware. It’s been my good fortune to visit Venice several times. On my first visit in 2002 the sun was shining and the sky was blue. That was lucky because we were there in March and Venice tends to be pretty gloomy at that time of the year. Because it lies between mountains and the Mediterranean Sea fog is a frequent wintertime occurrence. But we were there on a glorious day. I’ll never forget walking along the canals, through the ancient city of Venice. We were staying in a vacation rental about 40 miles away which enabled us to return a few days later. That day the sky was gray and the fog hung on all day but still we loved exploring. We bought a pass that allowed us to visit several of the largest churches, all of them old and impressive. We discovered the church called Basilica di Santa Maria Gloriosa dei Frari. A rare gothic church in Venice, the Frari (as it is commonly called) dates from around the turn of the15th century. 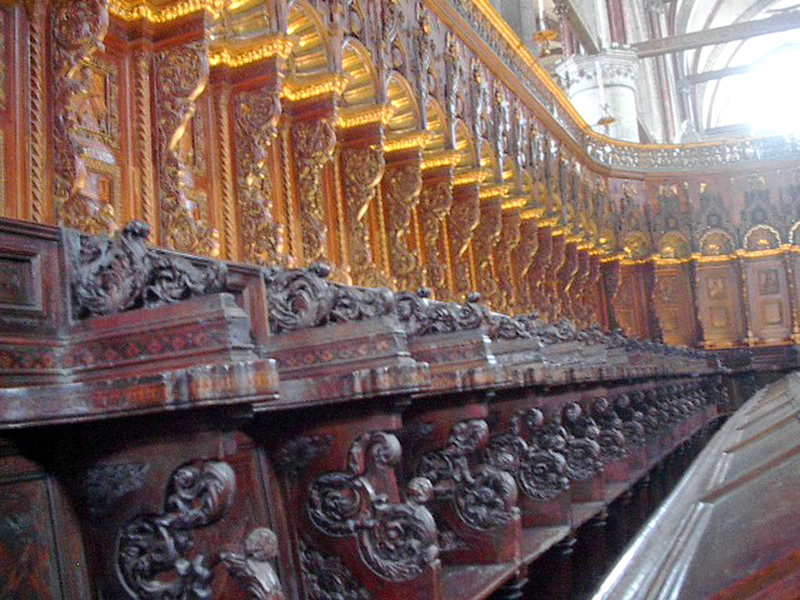 It is filled with intricate, centuries-old carving. The choir pictured at the top of this post is an example. The great Italian artist known as Titian is buried in this church in an elaborate marble tomb. Perhaps his greatest work, The Assumption of the Virgin, is installed over the main altar. In my days as a travel agent I often booked passengers on the ships of the company known as Star Clippers. I escorted two groups on cruises, once from Rome and the other from Athens. Each time I had the memorable experience of sailing into Venice at dawn on a true clipper ship. Seeing that magnificent city in the early morning light while standing on the deck of a small ship is a never-to-be-forgotten experience. I’ve created a slideshow featuring a few photos of Venice. 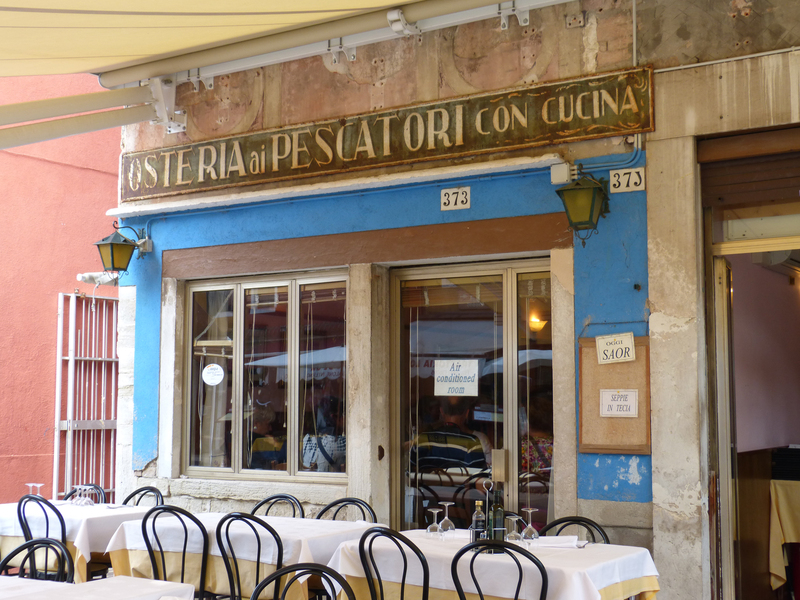 For readers who have been there, I hope these pictures of Venice will bring back good memories. For those who haven’t seen Venice yet, I hope it will inspire you to visit Italy and this important city. This post was written by my friend Linda Dodge. It’s about her three stays in Venice. I’m sure you’ll enjoy it. I have been to Venice three times. Thinking back on those three times, I see an evolution in how I booked our accomodations. I moved from picking something straight out of a guidebook to feeling very independent as I surfed the web and selected something on my own. Some of the growing independence came from more experience as a traveler and some came from the wonderful interconnectivity of the world due to the Internet. My first visit was in 1999, when the Internet for travel purposes was in its infancy. We stayed for three nights in a hotel near St. Mark’s Square chosen from one of Rick Steve’s recommendations. 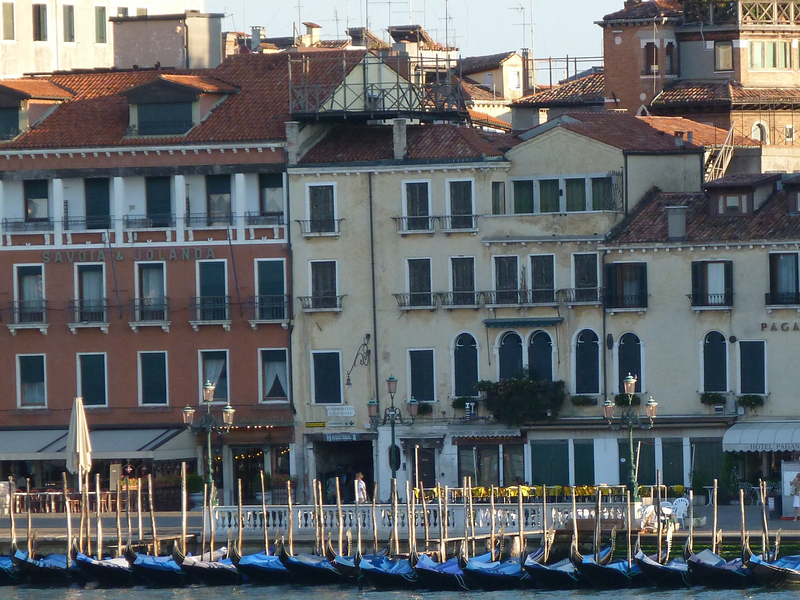 It was pleasant enough and featured many Murano glass chandeliers. The bathroom was definitely an add-on, located up two steep steps from the floor of the bedroom to get it squeezed in over a staircase. Negotiating those stairs and opening the door which swung outward was a bit of challenge, especially in the middle of the night when the door seemed to want to sweep me off the steps before I could step inside. 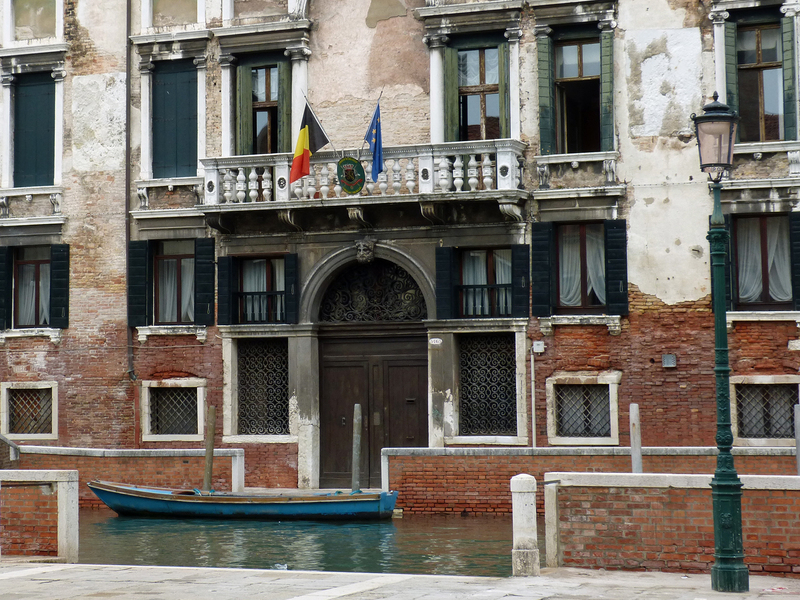 Best feature was the large shuttered windows that opened on to a canal that was frequently used by the gondoliers so it was not uncommon to hear the strains of Ole Sole Mio in the evenings. Breakfast was in the overly decorated breakfast room with loads of pink frou-frou and plates of cookies that were popular with the French travelers. My second visit came in 2006 when we booked through Untours (http://www.untours.com/ ). 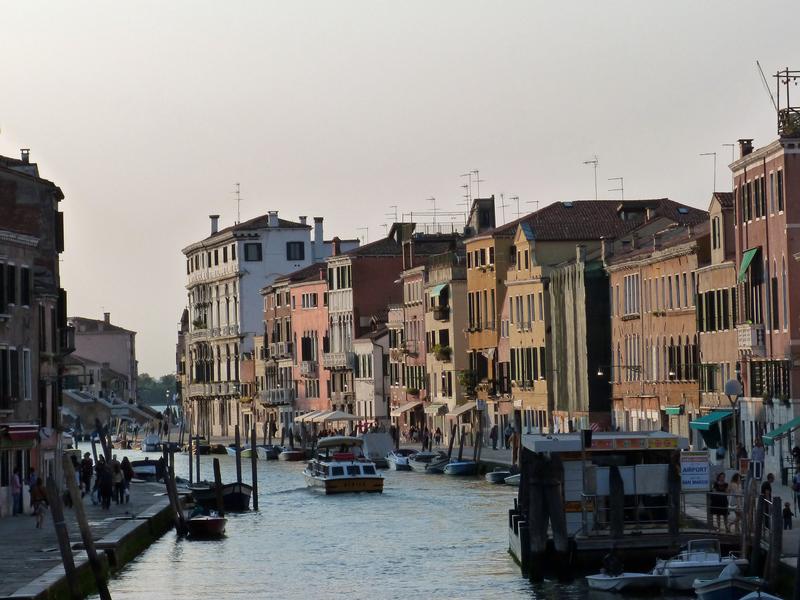 This time we spent two weeks in the Dorsoduro section, which is located behind the Guggenheim and Academia art museums. We had nice water views over the Guidecca Canal. 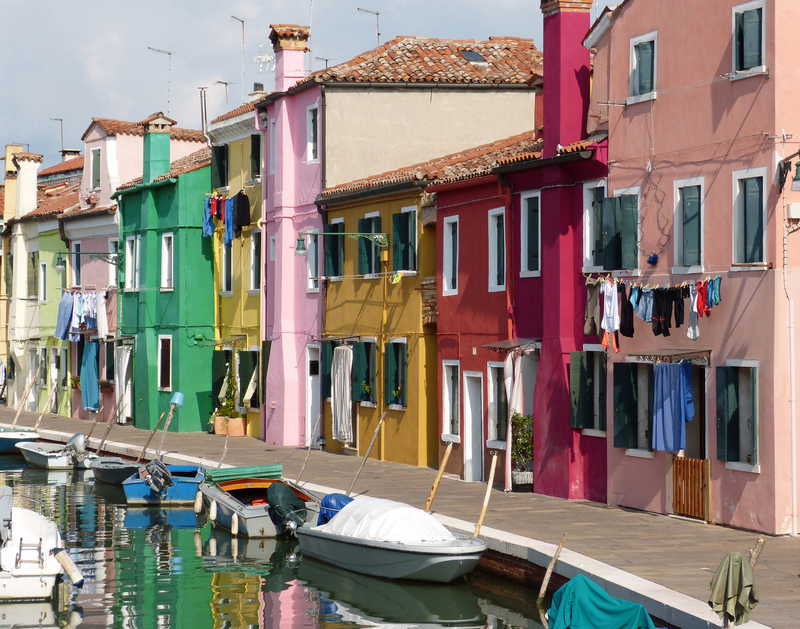 We chose Untours because they offered a two-week rental plus a local contact who met us at the airport, arranged a brief walking orientation to the neighborhood, a vaporetto pass, and a few half-day activities scattered over the two weeks. Housekeeping with fresh linens were provided once during our stay. We could also call this contact if we had any questions during our stay. This felt a bit more adventurous than staying in a hotel but not so adventurous that we didn’t have someone to call on. The apartment was lovely, comfortably furnished, light and airy. We bought museum passes and visited many of them, learned to use the *vaporetto as a refreshing way to rest our feet between museums and enjoyed getting to know the layout of the city well as we cruised the waters, jumping off at stops when we felt refreshed or curious about something on onshore. Every day we stopped for a spritz (a cocktail peculiar to the Veneto region). After shopping around we settled on our favorite watering hole the second week and stopped there every evening, nodding politely to some of the other regulars. We wondered if they asked each other ‘where are those American girls’ after our vacation ended. At the end of two weeks, we wished we could stay longer. The third visit came in 2015 when we went solo on the booking. After trolling the internet, I found http://www.trulyveniceapartments.com/ and was very pleased with them. 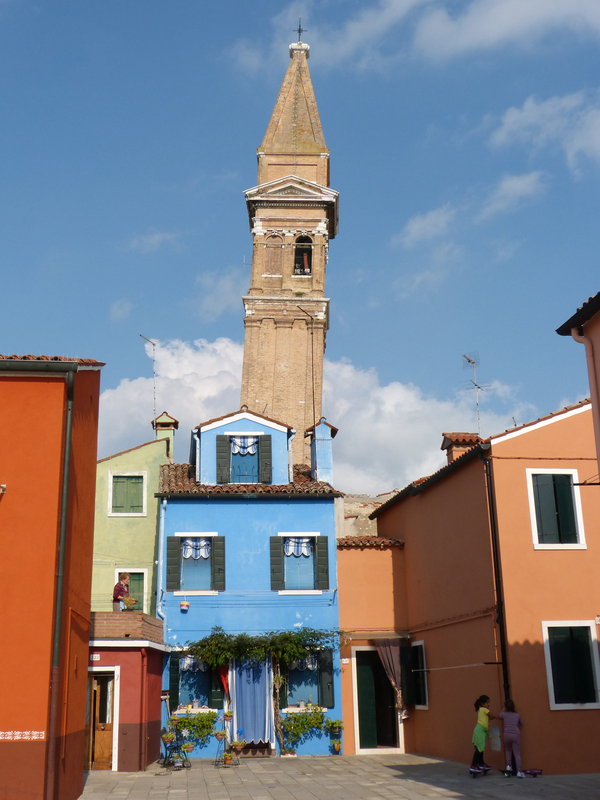 This time five of us were looking for a place and we found a three bed/two bathroom apartment located in Cannaregio. 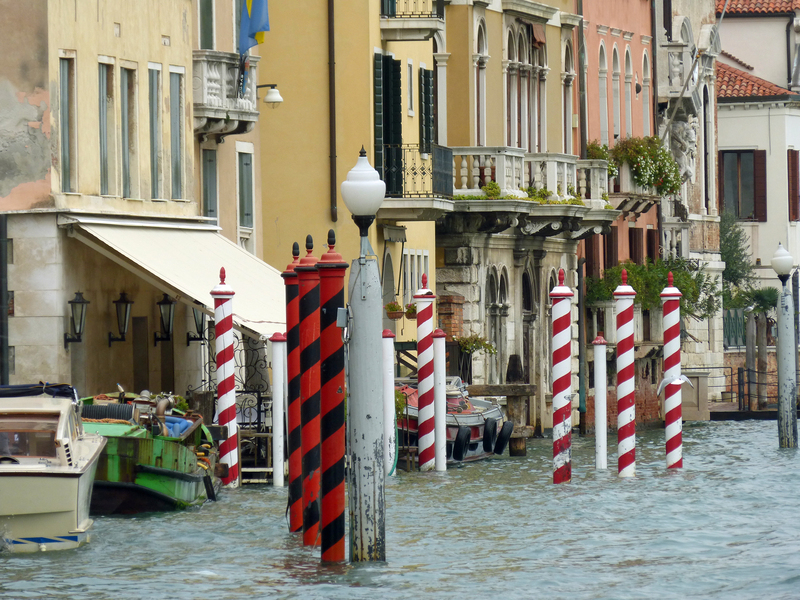 I wanted to see Venice from a different perspective than the previous two neighborhoods. This company provided someone to meet us at the taxi boat stop, walk us to our apartment, explain how everything worked, and provide light housekeeping halfway through our stay. This time we picked up our own vaporetto passes at the airport. My friends who hadn’t been to Venice before questioned the price of the vaporetto passes initially but were the first to say at the end of the trip that they were worth every euro and more! We love staying in one place for two weeks or more so we get to know the neighborhood. Also having the option to cook in or just munch on cheese and crackers is a nice alternative to dining out every night. 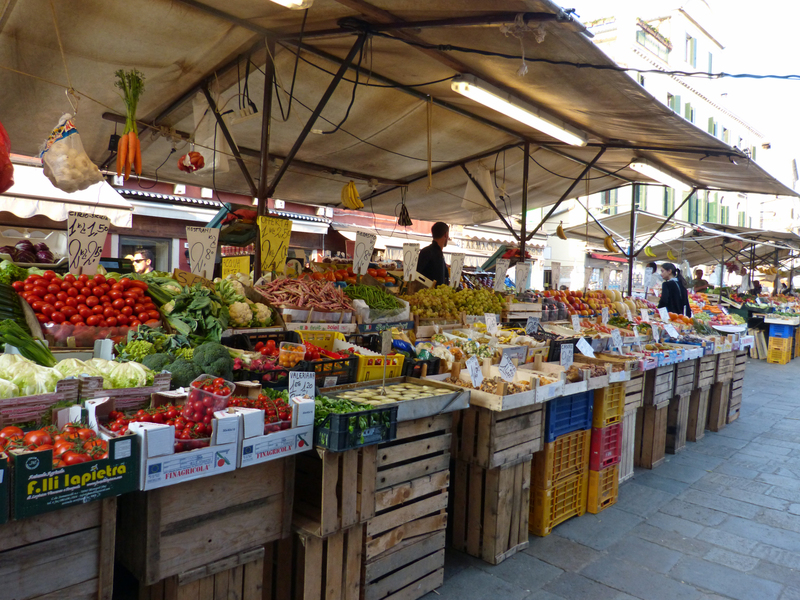 Visiting the open produce and fish markets in Europe is always a pleasure for me and it’s nice to buy and eat what we see and not just be onlookers. An on-site washing machine means less to pack. *Vaporetto is the name for a boat that serves as a public bus in Venice.